It's a lovable pot holder. I hope you like this project! This project can be used for real cooking, but if you want to you can use it for decoration, gifts, etc. It is your own decision. If you want to make it, cut out a heart, 3 circles, and some lining. Your lining should be at least a metre long, and the circles 15 centimetres diameter. Make the heart smaller than the circles. Put the 3 circles in a pile. 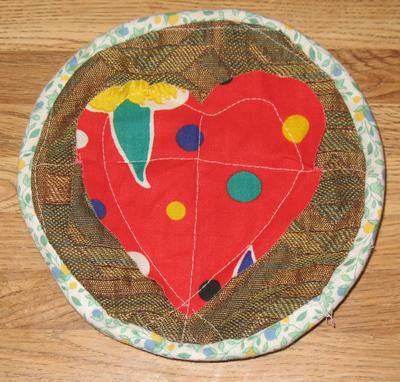 Take the top circle off the pile and sew the heart to the circle that you took off. Put the circles in a pile again. Make sure the circle with the heart sewed on it is on top of the pile. Sew around the edges of the circles, still in a pile. Sew the lining around 1 side of the pot holder, so it looks like a hat without a rim. Then, trim off excess lining. Fold the lining over to the side that has not been sewed yet. Then hand sew it, still folded over, so it is sewed on both sides. If you want it to look like mine, but you don't have to do it my way I used polka dots for the heart. I used green, yellow, white, and blue for the lining. I used brick/marble for the circles, but you can make it any colour YOU want. Maybe pink, white, and black would look nice. If you want, you can do different shapes. That is for you to decide. It's up to you! You could do red, white, and green for a Christmas gift, and instead of a heart you could do a square, and sew a bow on the square for a gift box. Use your imagination! clever project that you can use your imagination to design. Thanks for sharing!